These soft iced eggnog cookies are a lightly spiced cookie covered in eggnog frosting – perfect for Christmas cookie trays! I think I’ve mentioned before how much I love cookies with frosting on them. 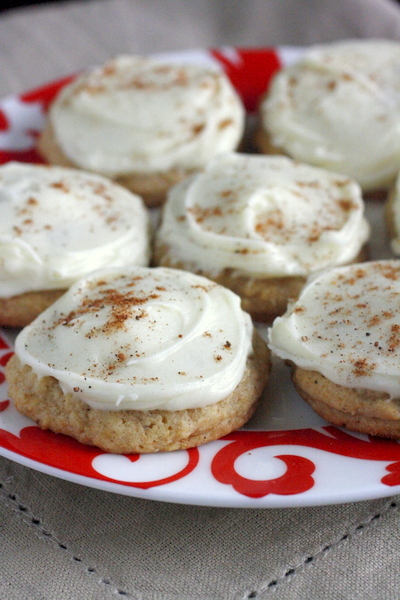 These soft iced eggnog cookies are no exception! 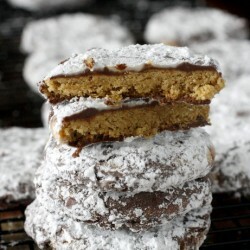 The cookies are lightly spiced and incredibly soft. They have a generous hint of eggnog flavor, but are not overwhelming. They taste more like nutmeg than actual eggnog. 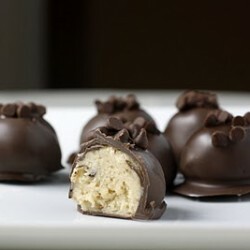 The frosting is creamy and delicious and also full of a spicy nutmeg/eggnog flavor. The end result is an absolutely delicious soft iced cookie that is perfect for Christmas. I’ve shared them with plenty of people who claim they don’t like eggnog, and every one of them has loved the cookies. 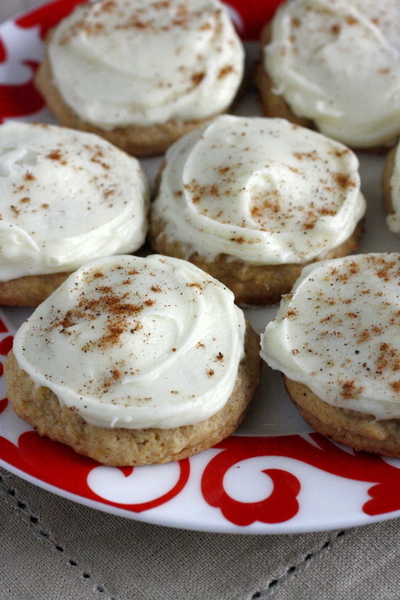 These soft iced eggnog cookies will definitely be pretty (and delicious!) additions to your cookie trays this year! 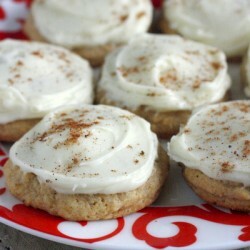 Soft Iced Eggnog Cookies are day 9 of the 12 Days of Christmas Treats! I will post a new cookie every day for the first 12 days of December. You can see all these recipes from over the years under my Christmas Cookies tag. 🙂 See all of this year’s cookies here: 12 Days of Christmas Treats 2015. Enjoy! And, as always, let me know if you try any and how you liked them. These soft iced eggnog cookies are a lightly spiced cookie covered in eggnog frosting - perfect for Christmas cookie trays! In a medium sized mixing bowl, whisk together flour, baking powder, salt, nutmeg and cinnamon. Set aside. In the bowl of an electric stand mixer fitted with the paddle attachment, beat together butter, granulated sugar and brown sugar until pale and fluffy. Mix in egg yolks one at a time, blending until combined. Mix in vanilla extract and egg nog. With mixer set on low speed, slowly add in flour mixture nd mix just until combined. Scoop dough out by the heaping tablespoonfuls and drop prepared baking sheets, spacing cookies 2-inches apart. 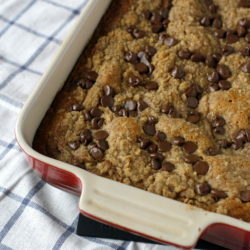 Bake in preheated oven 11-13 minutes, or until just set and bottoms are beginning to brown. Allow to rest on baking sheet several minutes before transferring to a wire rack to cool completely. In the bowl of an electric stand mixer fitted with the paddle attachment, whip butter until very pale and fluffy. Add in 3 Tbsp eggnog and mix in powdered sugar. Add additional eggnog to reach desired consistency. Frost cooled cookies and sprinkle nutmeg on top. Megan, these cookies look delicious and perfect for Christmas. If I bake them ahead of time and put in my freezer, should I leave off the frosting, and frost after the cookies thaw? Hi Megan, I was wondering if you chose not to add the rum extract from the cookie and the frosting that is in the original recipe or did you try it and not like it? I didn’t add it. I didn’t have it on hand, and the sound of it didn’t appeal to me, so I left it out. If you go back even farther to the recipe source (maybe AllRecipes or something like that), I don’t think there was rum extract in the original.